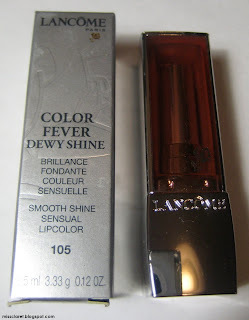 I saw Lancome's Color Fever Dewy Shine 105 Red Drop on Strawberrynet and could not resist. 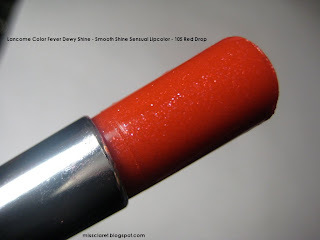 I was a huge fan of Lancome's Juicy Rouge in 133 Sorbet (now extinct) and thought it could be a suitable replacement. It was difficult to gauge the colour swatches on line, so I ordered the brightest looking red available. 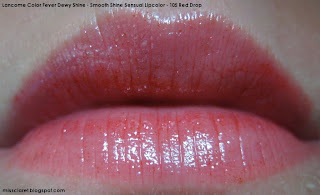 Despite the brightness of the lipstick itself, when applied, the shade is very very sheer. It is incredibly glossy and glassy in appearance and has gold flecks in it. Unlike most Lancome lip products I own, there is no fragrance. The other notable difference is that this product is made in Japan, which makes me think it could be an Asia exclusive item. Lovely to try - I would be inclined to recommend this product to those who are scared of red lipstick and are looking for a 'safe' red colour!